VME test rack for the Spiral 2 LLRF system, designed and built by the SIS. Accelerator instrumentation refers to all the sensors installed in an accelerator to provide information on its operating status and to tune it. Two of the main applications are beam diagnostics − position and profile monitors in particular − and low-level radiofrequency sensors to tune the field of accelerating cavities powered by RF power supplies. IRFU's SIS and SEDI departments are particularly involved in R&D on this area. BPM installed on the Califes accelerator, followed by its corrector. LLRF systems are used to control the RF field in accelerating cavities. These systems control the amplitude and phase of the RF field (fast tuning) and the cavity frequency (slow tuning), compensating for the effect of different types of disturbance such as vibrations, thermal stress, and the charge of the particle beam. 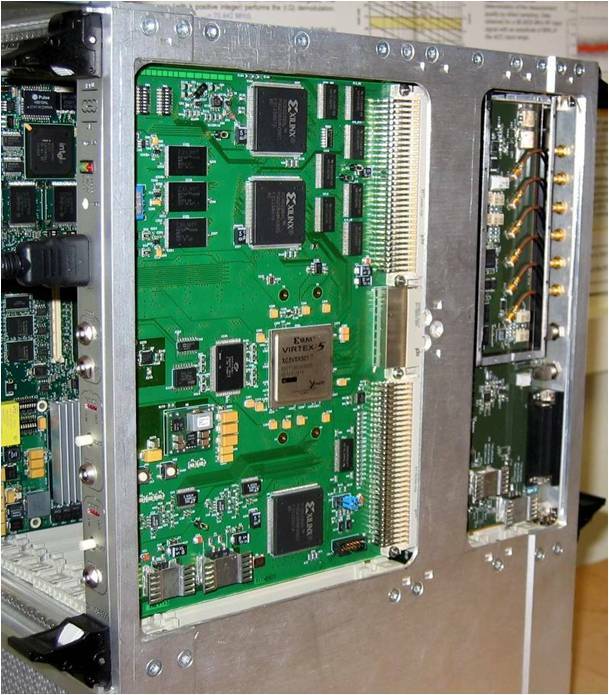 The SIS develops the electronics for these systems, which is based mainly on the use of FPGA or DSP boards for fast digital processing of the RF signals coming from the cavity. SACM develops general simulation tools for describing RF cavity operation with or without a beam, modeling various types of disturbance, considering the transfer functions of the associated high-power or low-level RF electronics, and representing accelerator field control modes. 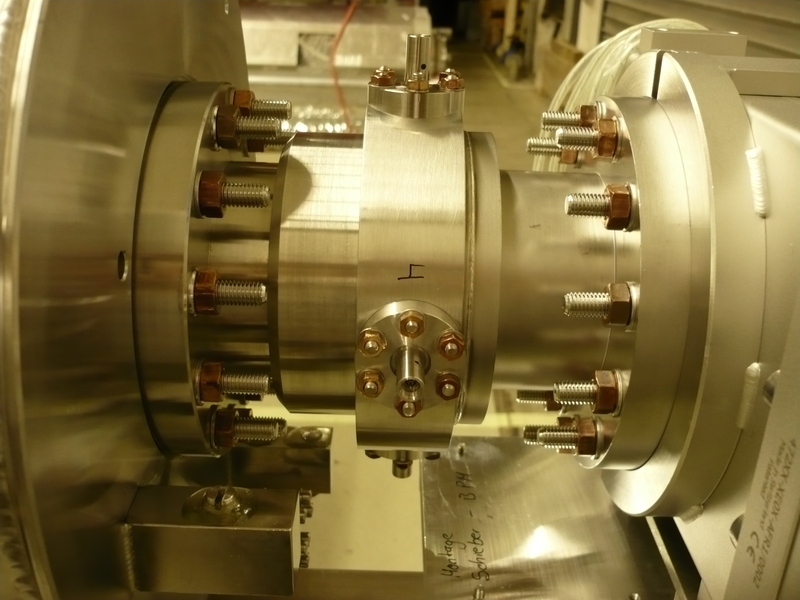 SACM was involved in developing a prototype for the Soleil accelerator, and is now working with the SIS on making the LLRF systems for the Spiral 2 project (the SIS is in charge of these systems). 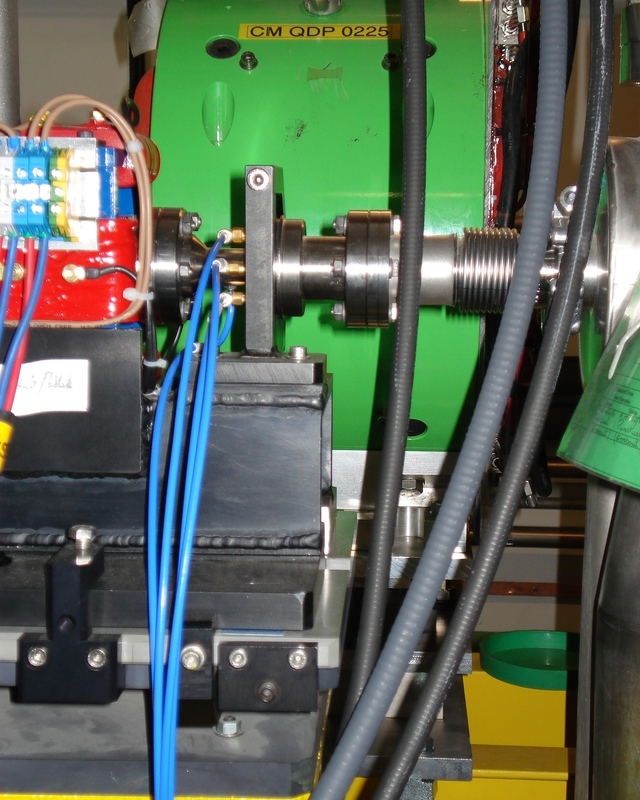 Beam position monitor installed on the PXFEL2 prototype module and connected to a cold quadrupole. Beam based alignment and time of flight control are essential operations for particle accelerators. SACM is currently developing two types of beam position monitors (BPMs) based on radiofrequency cavities. The operating principle is as follows: passing through the cavity, the beam excites some electromagnetic fields (resonant modes), which are coupled by four feedthroughs to the outside. Signals detected by the signal processing electronics extract the beam position (displacement), the beam intensity and the time of flight of the beam. Transverse profile of the complete beam and H+ species on SILHI, determined using the Doppler shift method with a two-meter-long Fujikura endoscope and a monochromator. SACM is also involved in the European XFEL project, where it is responsible for designing, building, and installing the cavity, antennas, and the analog electronics for 31 position monitors, known as reentrant BPMs, which will be built into the accelerating cryomodules. Those monitors are 170 mm long, with an aperture 78 mm in diameter. They will be mounted on the quadrupoles in the clean room at the DESY site, then sent to Saclay for installation on the cavity line. The monitors must meet the specific cleanliness and vacuum standards imposed in superconducting environments. A reentrant BPM of the same design has already been installed on the FLASH linac in Hamburg, where it achieved 4 µm spatial resolution, and 40 ns time resolution. Another type of reentrant BPM has been developed for the Califes probe beam. Six monitors with an 18 mm diameter aperture are installed on the transport line and can work in the different operating modes of the machine, i.e. in single-bunch or multi-bunch mode. The electronics required includes an analog electronic system, with a multiplexer to control the six monitors which delivers information to control system. Another monitor, known as a “button BPM”, based on a different design is currently under study for the FAIR project linac. The power per unit surface area of the ion beams in high-intensity accelerators imposes the use of non-interceptive diagnostics. The transverse profile, intensity, and position of the beam are determined by spectral analysis of the light emitted when the beam interacts with the residual gas. The use of CID (charge injection device) cameras, hardened to withstand radiation, allows optical analysis to be performed under high neutron and gamma flux. Collaborative work has been set up with the SEDI in this area. As demonstrated by the SILHI source, the H+, H2+ and H3+ species and their profile, can be measured by analyzing the Doppler shift of Balmer series lines. 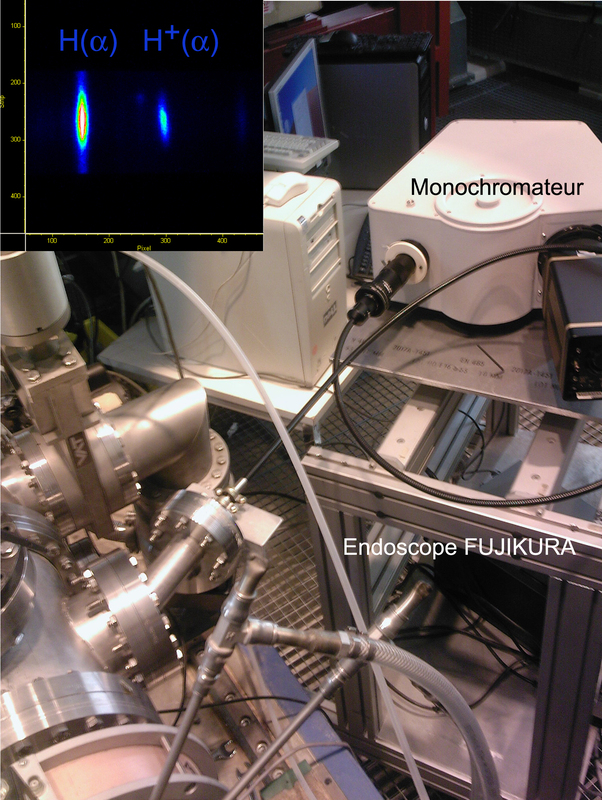 In order to protect the radiation-sensitive monochromator, the images are conveyed to it via a radiation-resistant, multifiber endoscope. These developments are a step forward for the characterization of intense beams in environments with high radiation flux.